Background: To determine if there are common factors beyond the learning curve that lead to recurrence after laparoscopic hernioplasty, we analyzed failures seen in seven centers specializing in laparoscopic hernia repair. Method: We performed a retrospective review of patients who had a laparoscopic hernioplasty (Tapp or Tep) between 1990 and 1996 at centers specializing in laparoscopic repairs (>500 repairs at each center). Results: In all, 7661 patients had 10,053 hernias repaired by the transabdominal preperitoneal or the totally extraperitoneal approach; they were followed for 1 month to 6 years. In patients followed for ≥6 months with a median follow-up of 36 months, 35 repairs failed (0.4%), and all but one of these patients underwent a remedial operation. Twenty-nine had a laparoscopic repair, four had a combined laparoscopic and anterior repair, and one had an anterior repair alone. The cause of failure was determined in all 34 patients. The mechanism of recurrence was inadequate lateral fixation of the mesh in 11 cases, inadequate lateral fixation compounded by too small a mesh in three cases, missed lipoma of the cord in four cases, inadequate fixation of the mesh medially to Cooper's ligament in eight cases (seven of which were associated with too small a mesh), a missed hernia in four cases, and a hernia through a keyhole in the mesh in five cases. As surgeons gained experience, the incidence of recurrence due to missed hernias or too small a mesh decreased. 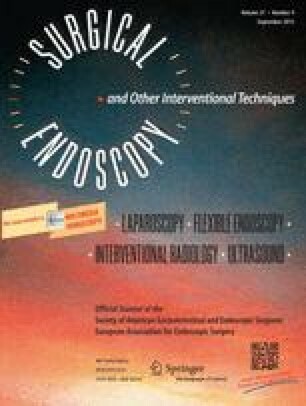 Conclusions: This large multicenter study demonstrated that the incidence of recurrence after laparoscopic hernioplasty performed by experienced surgeons was extremely low and that some causes could be corrected by experience, whereas others will require changes in technique or equipment.